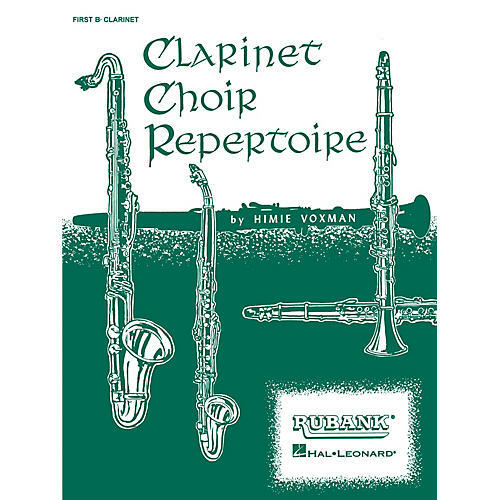 for three Bb clarinets, Eb alto (or 4th Bb) and Bb bass This wonderful collection of grade 3 music for clarinet choir appears on most state contest lists and includes pieces of varying lengths and styles to suit any performance opportunity. Includes classics as well as contemporary pieces by the original Rubank composers. A must for your school or church library. Contents: Air and Gigue (Handel) · Allegro (J.C. Bach) · Allegro Rococo (Koepke) · An Der Wiege (Grieg) · Andante and Rondo (Ostransky) · Ballad (Rimsky-Korsakov) · Blue Twilight (Walters) · Theme from Christmas Oratorio · Lyric Piece No.2 (Grieg) · Menuetto (Mozart) · Motet (Brahms) · Polonaise and Presto · Puer Natus in Bethlehem (Bach) · Valse a La Scherzo (Walters).